Social media has long been a bastion of modern-day snake oil salesmen. Twitter, in particular, is a great marketing tool. When it comes to food and product safety, the app’s 140 character message limit provides more than enough room to scare the bejesus out of the public. From there, it’s just a short hop, skip, and jump to the online store of the person making the frightening tweets. The sad fact is that all too often, the products being sold by the so-called expert contain exactly the same ingredients he/she claims to be dangerous. Caramel coloring has never actually been shown to be dangerous to humans. But let’s debunk Hyman on a different level. The doctor apparently makes a comfortable living selling expensive dietary supplements via his web site, drhyman.com. If you’ve read any of his books or blog posts, you know he’s not shy about pushing these supplements as part of his diet plans. For only $114 (!) we can pick up a 120 count bottle of “Neuromins”,2 a supplement designed (according to Hyman) to assist in the development of mental and visual functions. I’m all excited! Yes, that’s right: caramel coloring. 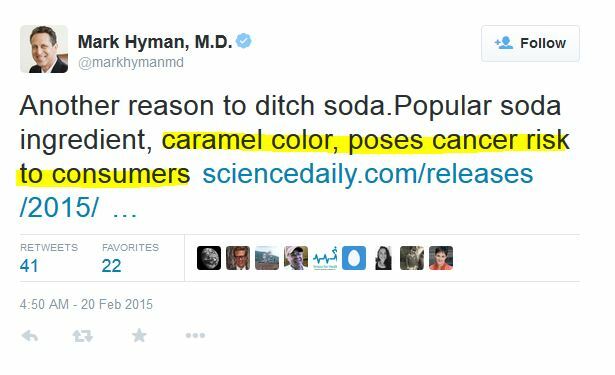 Didn’t Hyman just claim that caramel coloring was carcinogenic? Is the caramel coloring in Hyman’s supplements the same coloring found in the soft drinks he falsely and irresponsibly links to cancer? Why yes.. yes it is! Caramel coloring levels III and IV are most often featured in carcinogen propaganda campaigns run by pseudoscientists because they’re the ones used in the soft drinks, beer, and pumpkin spice lattes being slandered. I checked with the manufacturer of Hyman’s supplements, Pure Encapsulations, and they confirmed that the coloring they use is indeed level IV. Dr. Hyman, if you believe it causes cancer, why are you selling it? We must pause here and point out that while the health benefits of the product being discussed may be debatable (the claims haven’t been evaluated by the FDA), the safety of the product itself is not being called into question. As the manufacturer of the coloring points out, the coloring itself does have FDA approval (GRAS–“Generally Recognized As Safe”, CFR Title 21, Section 182.1235). 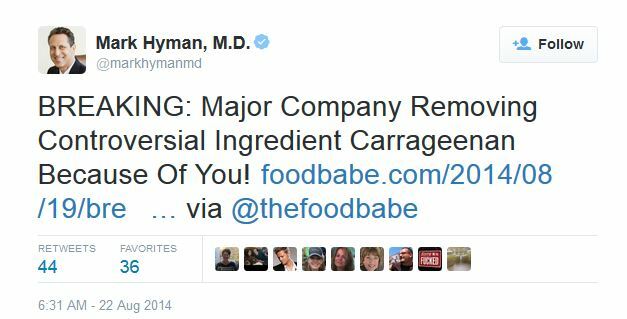 I sincerely hope no one will punish Pure Encapsulations because of Dr. Hyman’s hypocritical stance on a safe food coloring. This company was most transparent in answering questions about their product. No guilt by association, please. Sharp-eyed readers may have noticed I highlighted two ingredients on the Neuromins label earlier. Caramel coloring shared center stage with “carrageenan”. Why is this significant? Are you scared yet? Me neither. 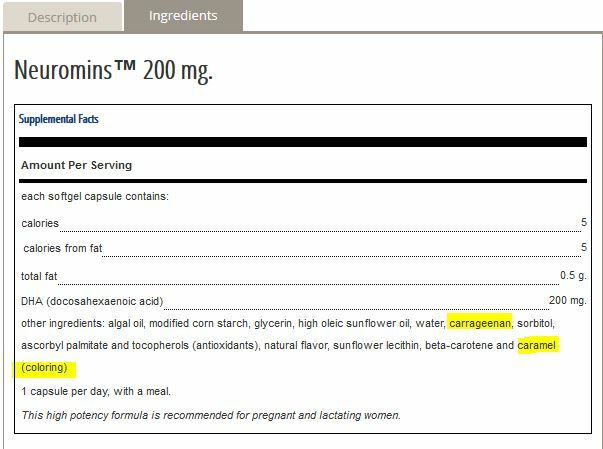 But, to summarize, let’s put the question to Dr. Mark Hyman: if caramel coloring and carrageenan are “carcinogenic” and “controversial”, why the hell are you selling them? As I pointed out in the first article in this series, this type of hypocrisy is (sadly) all too common with the snake oil aficionados. The fact that the seller in this case carries the initials “M.D.” by his name makes the offense all the more egregious. Dr. Mark Hyman material, Twitter, and Pure Encapsulations screen snapshots are used in accordance with Title 17 U.S.C. Section 107, commonly known as “fair use law”. This material is distributed without profit with the intent to provide commentary, review, education, parody, and increase public health knowledge.